Come to the library to take a look at the Tamworth Historical Society’s collection of Chinook Kennels memorabilia and photographs from February 11th to March 3rd. The New England Sled Dog Club was founded by Arthur T. Walden in 1924 in Wonalancet, also the site of the first sled dog race. The race manager was Richard Read who, with Milton Seeley, Earle Remick and Lincoln Steele, founded the Tamworth Outing Club in 1935. That first year the club opened Page Hill and Quimby Hill ski areas; had the first square dance at Seven Hearths in Wonalancet; started a local baseball team (the Tamworth Tigers); and sponsored the New England Sled Dog Race on Lake Chocorua. We have continued these ambitious programs to this day. Sled dogs have figured large in geographical exploration. Chinook, for example, is famous for his trip to Antarctica. Sled dogs have even served in combat missions in WWII. In 1926, the Poland Spring Derby held a 40-mile, two-day race and each musher was allowed a maximum of seven dogs on their team. Walter Channing joined with Arthur Walden with their Chinook dogs for the race. A small team of six Labradors and two women from Cambridge, Massachusetts — Caryl Peabody and Clara Enebuske — were to compete in the race. When Mrs. Peabody was injured and dropped out, Clara Enebuske continued with her team of six dogs, all sons of Walden’s lead dog, Chinook, and led by the beautiful long-coated Scamp. The first day of the race the roads were bad and Clara Enebuske was the big story, even though she finished last. She was only able to start with five dogs and finished the first day with four, one riding in the sled. She got a big round of applause for “not quitting”; the dining room guests crowded around the window to watch her come in. She declared she indeed would complete the second day of racing, with two dogs if she had to. 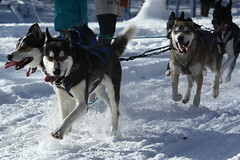 Mushers are very familiar with stories of perseverance, care for their dogs, and love of the trail. The Outing Club is proud to continue the tradition. Our program management was taken over from Richard Read by Stanley Coville, working with the New England Sled Dog Club and our loyal sponsors to bring you these popular sled dog races.